It is a question that all parents eventually face: should we enroll our child in preschool? If you ask us, the answer is easy. Preschool has a wide variety of benefits for your child that will last well into adulthood. 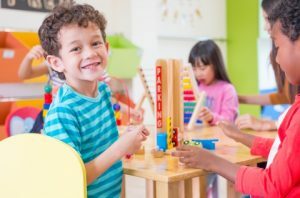 To help you decide if preschool is right for your child, we will look at three different benefits that you may not have considered. When you’ve finished reading this post, get in touch with a member of Joyful Praise Academy by calling 678-246-5852 or using our online contact form. We’ll gladly provide you with any additional information you need about our Alpharetta preschool. A good preschool is structured, even if it may seem chaotic to the outside eye. It’s important to introduce your child to structured activity early, as their classes will only become more and more regimented as they grow older. Many parents find themselves concerned that preschool will be too structured for their child, but at Joyful Praise Academy, we believe that we’ve found the ideal mix of structure and fun. Your child will be introduced to basic counting, language skills, and other important fundamental aspects of learning that will help them as they grow older. Preschool is often the first time that your child will be introduced to a large group of peers. Many children who do not attend preschool find themselves slightly overwhelmed when they jump into kindergarten or elementary school, but preschool can help your child make the transition from life at home to a school with other children their age. Your child will learn to develop empathy, self-confidence, and cooperation when they’re exposed to children from other walks of life, and these important skills will set them up for success as they grow older. Additionally, attending preschool will also give your child an opportunity to interact with adults who are not their parents. This is an important developmental step that many parents overlook when deciding if preschool will be right for their child. There is no need to wait until your child is in kindergarten for them to begin learning. In fact, getting a head start on learning is something that will stick with your child throughout their academic career. Rest assured, the academics of preschool are balanced well, because here at Joyful Praise Academy we know that your child still needs plenty of structured playtime. But getting any kind of head start is a major advantage for them, and numerous studies suggest that children who begin learning in preschool do better in elementary school than children who do not. If you are ready to enroll your child in a high-quality preschool, Joyful Praise Academy is here for you. Our preschool is much more than simply childcare in Alpharetta — we can help you set your child up for lifelong success in a faith-based program. We believe that it’s never too early to begin fostering a love for God, and we’ve dedicated ourselves to integrating faith and a sense of religious curiosity into our curriculum. We recognize that finding the right preschool for your child is a big decision, so please do not hesitate to reach out to us with any questions or concerns you have. We’ll answer any questions you have and provide you with everything you need to know in order to make an informed decision for your child. We hope to hear from you soon!